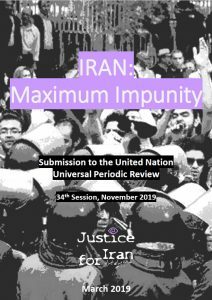 Justice for Iran (JFI)’s submission highlights the failure of the Islamic Republic of Iran (IRI) to implement the recommendations from the first and second cycles of Iran’s UPR concerning the duty to investigate and prosecute serious human rights violations which fully or partially enjoyed its support. 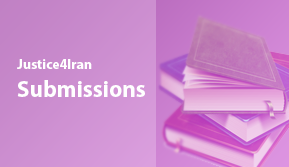 This submission focuses on some examples of serious human rights violations which have occurred over the past four years as showcases to demonstrate that the IRI has no intention of fulfilling its duty to investigate these abuses and punish the perpetrators, fostering a culture of impunity. The abuses include extrajudicial killings of protesters and unlawful deaths in custody in relation to the events of late December 2017-early 2018. 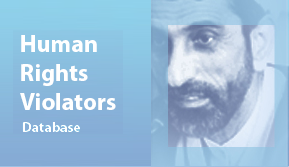 They also include the continued denial of the rights to truth and justice of families of forcibly disappeared persons and concealment of the fates and whereabouts of forcibly disappeared persons by deliberate attempts, such as destruction of mass graves from the 1988 massacre of political prisoners.